MISS NATASHA ENQUIST: ELECTRO-ACCORDION CHANTEUSE: Schoolhouse Rocks!!! Join Theatre SKAM and 12 Local Companies for a Homegrown Theatre Experience! 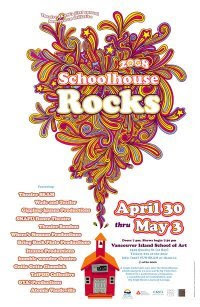 Thirteen independent performance companies have come together to create Schoolhouse Rocks.This event features thirteen new short performances, a visual art installation, and a funky little lounge all tucked under the roof of a vintage schoolhouse.